Earlier this week, I lamented the beers of Yards, a local brewery that I've never really connected with. Last night, whilst on a drunken quest for pizza, I spied a sixer of Boxcar Brewing's Original Ale. I'd just recently heard about this online, as the brewery is apparently located in West Chester, PA, which is where I live, so this is probably as local as it gets (distribution is limited to Southeast PA at this point). As we've already established, I'm a total homer, so I immediately picked up the six pack and anxiously awaited the pizza and beer meal I was about to consume. 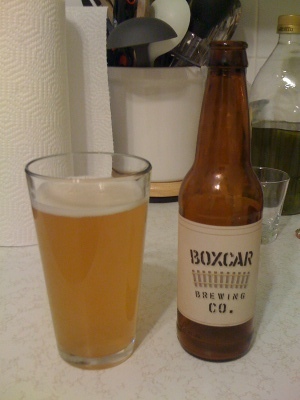 Boxcar Original Ale: Pours a light, hazy yellowish color, with a small head. The head did retain itself and there was lots of "lacing" as the beer nerds call it as I drank. The smell was lightly sweet, with some citrus thrown in for good measure. Taste was also a bit mild, with some malts and hops coming through, and a hint of that citrus flavor as well (it's a bit lemony, which is a nice touch). BA calls it an American Pale Ale, but it feels more German in style, maybe even something with wheat in it. It strikes me as a nice summer ale, light and crisp. Unfortunately, when you put all this together, you don't really get anything that stands out too much. I don't really detect anything wrong with it, but at the same time, there's nothing particularly amazing about it either. It's light and mild, which is fine, I guess, but not something I'm going to immediately run out and shove into people's hands telling them that they need to try it. This is apparently the only beer that Boxcar makes right now (having just launched earlier this year), and it shows a lot of promise. With some tweaking, I think this beer would come out better, but as of right now, there's not much to differentiate this from the throngs of other startups. I'm sure part of this is my homer instincts talking, but I'll give it a provisional B- (I suspect some might rate it lower). Beer Nerd Details: 5.0% ABV bottled (12 oz). Drank out of a pint glass. I don't really understand why new breweries start with this kind of mild beer. I suppose it's inoffensive, but at the same time, it's not particularly memorable either. I look forward to new and hopefully more ambitious efforts from this brewery. Even if I don't see myself falling back on the Original Ale too often, I think it does show a lot of potential from this tiny upstart. In any case, Victory remains the champion home team for now. This page contains a single entry by Mark published on October 30, 2010 12:01 PM. Jackass and Young's Double Chocolate Stout was the previous entry in this blog. Grindhouse Double Feature: Tripels is the next entry in this blog.